Hola my little, sweet, pink pumpkins! To talk to you about today's post, I need to talk to you about how I got the idea to do it first. And don't worry! I won't talk too much. The other day, I was randomly surfing on Wordpress when I found this daily prompt thingie, where they give you a post idea daily. I found a couple of very interesting ideas and one of them was "Pick a random word and do Google image search on it. Check out the eleventh picture it brings up. Write about whatever that image brings to mind." I thought it was random, easy and inspiring. 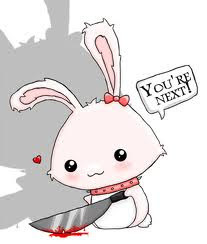 This adorable little homicidal bunny was the 11th image I found. I have to be honest I tried a few other words before this one because none of the 11th images was inspiring.. So, it wasn't not really a "random" selection! Hmmm.. What does this bring to my mind? Don't judge a book from its cover. So, I'm going to talk a little bit about that (the don't judge a book thingie..) But, I talked a lot already therefore I'll abbreviate. Looks do not reflect personality. Someone might look very mean, rude, unlikable and turn out to be the nicest, most polite, lovable people ever! And the opposite too. Nowadays, we judge everybody according to their appearances! She's too fat/thin, she must have emotional problems; she's fake (plastic), she must have insecurity problems; she's unstylish, she must be geeky and boring; she's wearing a veil, she must be a terrorist.. And the list is endless. 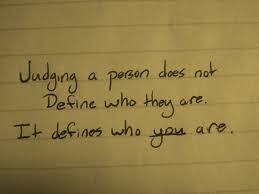 And what people say about them. However, get to know them better! Ask THEM about themselves, not people! And only then, you can judge them according to their personality! I don't know if it's me or not, but people I know for a while don't look the same way as they did when I first met them. They don't physically change in reality, but in my eyes they either get cuter, more handsome or beautiful or the opposite or just different. Does that happen to you too? Ten faces tag: Campaign for PET esteem!